The Great Depression transformed American social and political institutions and the ways individual people thought about themselves and their relationship to the country and the world. Though no two people had the same understanding of the Depression, everyone felt challenged and changed by the experience. By 1932, three years after the initial crash, near thirty million Americans had lost their source of income, from unemployment or loss of a family breadwinner. This included more than a quarter of the population of Washington State. Of those lucky enough to have consistent work, more than half were reduced to part-time schedules. Though there had been devastating economic depressions before, the 1930s crisis encompassed both urban and rural regions and devastated middle-class and working-class people alike. After 1933, the expansion of the New Deal meant that the government now intervened much more clearly in people’s daily lives, employing them and giving them aid, as well as providing new forms of social insurance. A wave of labor strikes and unionization allowed for a new way of thinking about the power of ordinary people and racial and gender divisions. Some responded to the crisis by looking for different forms of social, political, and economic organization, and turned to radical— and sometimes, conservative —movements. Burgeoning arts movements and media innovations, like radio, allowed for multifaceted forms of expression. Beyond these larger changes, people in Washington and across the nation developed new household and work practices, navigated emerging social systems of welfare, explored different avenues of social protest, and reworked their understandings of their role in communities, in the nation, and in the world. Ethnic communities in large cities, often marginalized by race or religious categorizations, sought out different strategies for economic and social survival. Nearly two weeks of state-wide then national bank closures in 1933 meant that cooperative systems of checks and bartering had to replace cash. Sports took on new meanings for community involvement and pride, while female students at the University of Washington redefined what "women's education" and women's roles might be. The repeal of prohibition changed how leisure was understood, while at the most intimate level, family relationships adapted to the new conditions of work and unemployment that the Depression brought. Whatcom County residents developed new social and familial roles in response to economic hardship. 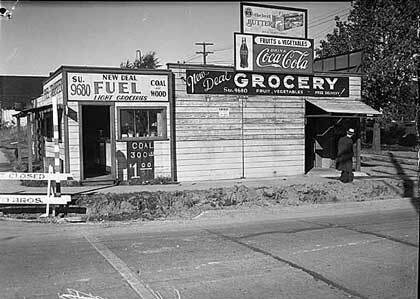 Like other resource dependent communities in Washington State, the town of Raymond struggled during the Great Depression. A local newspaper, the Raymond Advertiser, chronicled the challenges of the 1930's, while also striving to maintain optimism and consumer confidence among local residents. Mason City, WA was built by federal New Deal funds and private contractors to house the workers and families who were building the Grand Coulee Dam, and was consciously promoted as an example of the social vision, technological capacity, and high standard of living that New Deal America aspired to. A statistical sample of consumer advertising from 1928-1935 in the Seattle Times. Crime was one way Seattle residents dealt with the Great Depression. 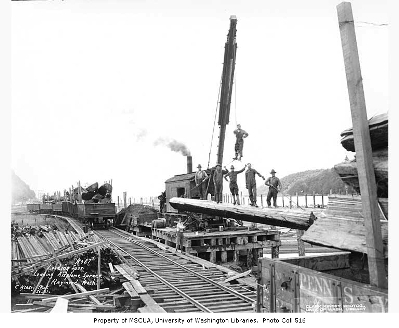 During the early years of the Great Depression, many communities in Washington State and across the nation struggled to survive economically. In Kitsap County, however, residents were able to rely upon a network of strong local businesses as well as a productive agricultural sector to help weather the finacial storm.